The Department of Transport, Tourism and Sport wishes to highlight a report published by the Marine Casualty Investigation Board into the sinking of “MFV Iúda Naofa” and to draw the attention of all vessel owners to the procedure for safe use of Hi-Line when receiving assistance from a Search and Rescue (SAR) Helicopter. The full report may be obtained from the website of the Marine Casualty Investigation Board at www.MCIB/243.ie. Vessels at sea requiring assistance are always moving. In order to enhance safety, the SAR helicopter crew may opt to use a helicopter supplied ‘Hi-Line/Heaving-in line’, often abbreviated to ‘Hi-Line’. A Hi-Line consists of a weighted rope extension to the winch wire which is lowered down to the vessel. It is connected via a weak link to the aircraft's winch hook. The receiving end of a Hi-Line has weights attached to it and the other end is attached to the helicopter winch hook. In some environmental conditions it may not be possible to winch the helicopter crew member, (referred to as a winch man or winch person), or the strop (rescue harness) from a position directly above a vessel to a preferred position on the vessel's deck. In such situations, the helicopter crew will lower a Hi-Line to the deck before the winch person is deployed from the helicopter. Hi-Lines must be tended by crew members on the receiving vessel. 1. To reduce the swing on the hoist cable when the winch person is being lowered to the vessel. 2. To assist the winch person to land on the vessels deck safely and accurately. 4. To help pass equipment to/from the vessel if required. The Hi-Line must never be secured (attached) to the vessel. The vessel’s Hi-Line party MUST wear LIFEJACKETS and protective GLOVES. 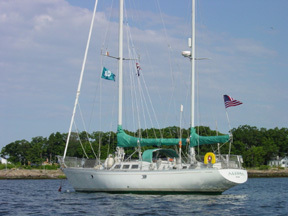 The two person Hi-Line party are deck crew who will receive the weighted end of the Hi-Line. They should provide an empty container (e.g. bucket or fish box) to collect slack Hi-Line. One person should tend the Hi-Line, taking up the slack on the Hi-Line and hauling in only when instructed to do so by the helicopter crew, either by radio message or hand signal. The second crew member should coil the slack line into the empty container, ensuring to keep it clear of any obstructions. If the helicopter has to break away during the operation the line must be paid out or, if necessary, released completely ensuring that the line passes clear of any obstructions on deck. Crew must be extremely careful not to get entangled in the Hi-Line. The SAR helicopter will lower the Hi-Line to the vessel’s deck party. 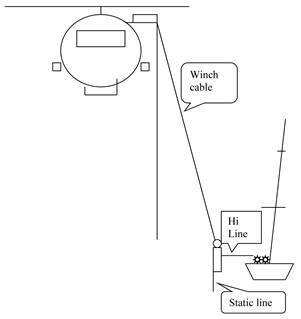 When the winch person appears, the vessel’s deck party should pull the Hi-Line (and therefore the winch person) onto the vessel’s deck. It may be necessary to apply sizeable force when pulling in the Hi-Line. In certain circumstances equipment such as pumps or stretchers may be lowered onto a vessel. Ordinarily the Hi-Line and the winch person are lowered to the vessel’s deck before any other equipment. In such circumstances the winch person will supervise the lowering of a pump or other equipment. In exceptional circumstances where deemed necessary by the vessel or helicopter crew a pump may be lowered without the presence of a winch person, i.e. once a Hi-Line connection is established. The deck party should endeavour to guide the pump onto a suitable deck space and should disconnect the pump from the winch hook as soon as possible. Instructions for operating the pump are contained inside the equipment bag. Vessels should endeavour to head into wind and await further instructions from the Helicopter crew. The vessel should maintain its heading unless otherwise instructed by the helicopter. Accept Hi-Line in a clear area deck area preferably on port or starboard quarter but subject to confirmation by the Helicopter crew. Deck crew should wear lifejackets and gloves. One member of crew should haul in the Hi-Line as it is lowered. The second crew member should coil the Hi-Line into an empty container (bucket or fish box). The Hi-Line should not be attached to any part of the vessel. The winch person should be pulled towards the vessel when s/he indicates it is safe to do so. Tension should be maintained on the Hi-Line at all times. When the helicopter commences to recover the Hi-Line, tension should be maintained until weights are in hand at which stage they should be released ensuring that that they are kept clear of any obstructions. Static electricity can build up in any hovering helicopter. A static discharge wire is attached to the end of the winch cable which enables the static electricity to discharge through the discharge wire.